Google’s newest AI experiment hopes to connect people to the ancient art of shadow puppetry. What started as an interactive installment last year has become an online application for exploring shadow puppets. The original allowed people to explore shadow puppets by using AI to analyze their hands and create animated characters based on the ‘shadows’ of their hands. However, the limited nature of the physical installment inspired the team behind the project to bring it online so anyone could experience it. That lead to the creation of ‘Shadow Art,’ a browser-based game where users must use hands to make one of the twelve zodiac animals from the lunar cycle in front of their computer or phone camera. The web app provides an on-screen guide to help you make the right shape with your hands. The AI component then maps your hands’ shadow onto the screen and transforms it into an animated character when you successfully match the shape. To add some challenge, the team implemented a 20-second timer for each shape. Users will have to beat the clock when making their shadow puppets. Further, users have to try and make it through the whole lunar cycle as fast as possible. Shadow Art is available in eleven languages, including English, Chinese, Thai, Japanese and more. To try your hand at shadow puppetry, simply navigate to ‘shadowart.withgoogle.com’ with Chrome for Windows, Mac or Android, or with Safari for Mac or iOS. 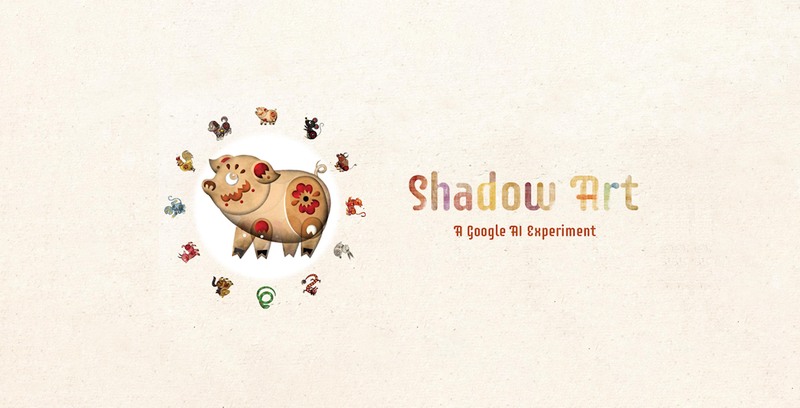 Google is keeping with the shadow puppet theme with its Lunar New Year doodle, which features a pig shadow puppet. To learn more about how Google created Shadow Art, check out the company’s blog post here.